Which hard-to-find cereal is easy to find on Halloween? This cereal is a sweeter variation of original Cheerios. As the name indicates, it's flavored with honey and nut flavoring (most notably almond). Prior to 2006, the cereal's ingredients included actual nuts. Nut flavoring has been used since that date. 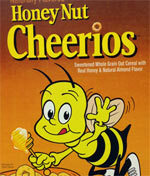 The cereal's mascot is bee known as buzz which helps explain the cereal current catch phrase "Bee Happy. Bee Healthy." "You already know that Honey Nut Cheerios packs the goodness of Cheerios with the irresistible taste of golden honey, making it a family favorite. But did you know that each little "o" also contains soluble fiber from whole grain oats? 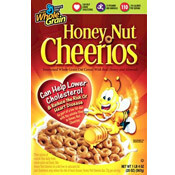 As part of a heart-healthy eating plan, eating Honey Nut Cheerios each day can help lower your cholesterol. And it's made with whole grain, low in fat and provides 13 essential vitamins and minerals. That's something that everyone can smile about!" What do you think of Honey Nut Cheerios? 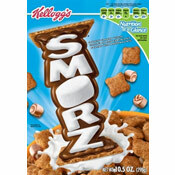 View all 22 comments for this cereal. 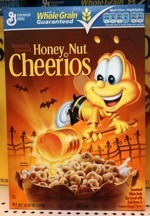 Voice Actor Billy West was the Honey Nut Cheerios bee for many years. He also is known for Fry, Dr. Zoidberg, Hubert Farnsworth and Zap Brannigan on Futurama. Also don't forget Ren & Stimpy, Doug Funnie, Porkchop, Roger Klotz and Bugs Bunny (Space Jam). I do NOT miss the bits of nut in the cereal. I used to not buy it very often for that reason. Ever since they got rid of them, I've eaten 10x as much. The leftover milk is some of the best there is. The cereal was ruined in 2006 when they change the recipe. I refuse to buy it ever again. I miss the little pieces of nuts that were once in this cereal but are now gone. My family grew up eating Honey Nut Cheerios... my wife and I still eat it occasionally. This cereal is a bit too sweet. Multigrain Cheerios are a bit too bland. I put Cheerios in my rotation occasionally, but this cereal is nothing special to me. The taste is one-dimensional, like cardboard. I can understand the appeal from a nostalgia standpoint, but there are so many other better cereals out there. They don't stay a nice crunchy consistency for very long, the flavor gets old quickly while eating a bowl, and the leftover milk isn't very delicious. This cereal is much better when supplemented with additional sugar, honey or agave nectar. Great tasting with a wide appeal; no wonder it's such a best-selling cereal! This cereal was a lot better when it actually had little nut pieces on it. Why do they change successful cereals? To save money I guess.